The Canadian Nuclear Association said (CNA) that a roadmap released this week for the deployment of small modular reactors (SMRs) lays the groundwork for Canada to lead globally in the development of innovative nuclear technologies of the future. It is intended to add momentum to Canada’s efforts to be a center of SMR technology development, production, and use. clean electricity to existing power grids, particularly those needing to replace fossil fuels for their baseload generation. identification of policies that might impact SMR feasibility in Canada. The roadmap does not make distinctions regarding light water v. advanced nuclear reactors designs such as molten salt. Market readiness along the line of technology maturity will be a success factor especially in this decade. Missing from the list is an answer to the question how to develop a workforce that is willing and able to work for long periods of time in remote locations in Canada’s sparsely populated territories. Aligned with that question is the issue of getting components to the sites, supporting the plants once they are in operations, and providing ongoing operations and maintenance of them in harsh winter conditions. 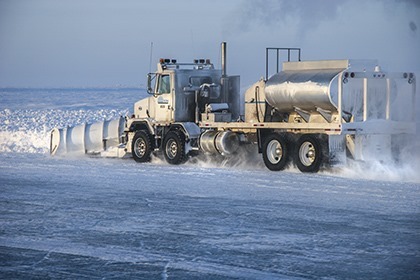 Note that while “ice road truckers” have brought heavy loads across frozen lakes and rivers, none of them have handled a freight manifest that includes an SMR RPV. For instance, NuScale estimates the total weight of one of its 50 MW units is about 700 tons. Even if shipped in pieces, some regions lack both road and rail transportation infrastructure to support delivery of the components. Even before that Canada’s indigenous communities have been notoriously hard over in opposition to uranium mining. Would anyone care to predict what their responses would be to small modular reactors? While diesel fueled generator power is expensive, and dirty, SMRs would also bring growth and unpredictable and possibly disruptive socio-economic changes to their communities. This is why the roadmap puts so much emphasis on “consultations” with these communities. There is a question of the long distances that electric distribution grids would have to cover to deliver the power. This raises the issue of pricing and whether the small communities targeted for SMRs could afford the electricity generated by them. While generation costs would be lower than diesel fuel, someone has to pay for the new power lines. Is this something the government is prepared to do? Also, if this blog had a nickel for every time a nuclear reactor vendor had it in mind to sell its reactors to the Alberta tar sands oil companies, I’d have long since retired. The tar sands oil firms are not going to make these kinds of long term capital investments when current methods of producing steam for their operations are cheap and cost competitive. Bruce Power learned this lesson nearly a decade ago when it tried to sell two 1,000 MW PWR type units to the tar sands industry. Note that Canada’s more heavily populated areas in a string of cities from Montreal to Ottawa to Toronto might be more robust markets for SMRs, these regions are also served by existing full size nuclear power plants. Similarly, there are population centers in Saskatchewan, Alberta, and British Columbia that might be markets for SMRs. The roadmap also identifies exports of SMRs as a market mechanism and it should be explored. World Nuclear News reports that the roadmap recommends actions according to four initiatives. Demonstration and Deployment includes calling on the federal government, and provincial governments interested in SMRs, to provide funding to cost-share with industry in one or more SMR demonstration projects for advanced reactor designs. Policy, Legislation and Regulation identifies priority actions under the Canadian impact assessment process, to ensure that nuclear liability limits for SMRs are aligned with the risks they pose. International Partnerships and Markets focuses on frameworks for strong and effective international engagement on SMRs. The report concludes that SMRs are a response to market forces for “smaller, simpler and cheaper” nuclear energy. If successful, it says, there will be a large global market for this technology, “driven not just by climate change and clean energy policies but also by the imperatives of energy security and access”. The new roadmap is the result of a 10-month engagement process with the industry and potential end-users, including indigenous and northern communities and heavy industry. It includes over 50 recommendations in areas such as waste management, regulatory readiness and international engagement. It still has a long way to go. The government said it welcomes the roadmap and is reviewing its recommendations. The report, A Call to Action: A Canadian Roadmap for Small Modular Reactors, was unveiled at the Generation IV and Small Reactor (G4SR) conference in Ottawa. CNA President and CEO John Barrett said the Roadmap lays the groundwork for Canada to lead in the development of innovative low-carbon nuclear technologies. Canadian Nuclear Laboratories (CNL) last year set the goal of siting a new SMR on its Chalk River site by 2026, and co-hosted an SMR Vendor Roundtable as part of the G4SR conference. “As a safe, reliable and low-carbon source of energy, SMRs have a number of unique features that could make them a unifying technology here in Canada,” CNL President and CEO Mark Lesinski said. Canada’s mature nuclear supply chain and “vibrant pool” of skilled, innovative companies gives the country a distinct advantage in the deployment of SMR technology, he said. Of course much of this “vibrant pool” is already employed at existing nuclear reactors. Where will the new workers needed to support a components supply chain, build and operate SMRs, come from? The roadmap could be improved if it addressed these labor force issues. Also at the G4SR conference, NuScale Power announced that Ontario Power Generation Inc (OPG) had agreed to support NuScale in its vendor design review (VDR) for its SMR with the Canadian Nuclear Safety Commission (CNSC). The two companies have signed a memorandum of understanding (MOU) on the agreement, which NuScale Chairman and CEO John Hopkins said was an “important milestone” in the company’s efforts to bring its reactor to Canada. Under the agreement, OPG will offer expertise to support NuScale’s VDR application, which is currently under development with the CNSC, as well as the further evaluation of development, licensing, and deployment of the first NuScale power plant in Canada. The CNSC offers the pre-licensing VDR as an optional service to provide an assessment of a nuclear power plant design based on a vendor’s reactor technology. The regulator announced in February 2018 that it had received NuScale’s application for a review of the self-contained 50 MWe integral pressurized water reactor, and is now developing a service agreement prior to setting a start date for the review. CNNC lists 10 SMRs on its website as seeking or which have indicated intent to seek, pre-design reviews. World Nuclear News reported last February that Westinghouse has also submitted an SMR design to the Canadian Nuclear Safety Commission for pre-deign review. The firm is developing the eVinci micro reactor as a small nuclear energy generator for decentralized generation markets, such as remote communities, or arctic mines. The frim describes the reactor has having a solid core, built around a solid steel monolith with channels for fuel pellets and heat pipes that remove heat from the core, and has minimal moving parts. Fuel is encapsulated in the core, which the company says significantly reduces proliferation risk and enhances overall safety for the user. The heat pipes enable passive core heat extraction and inherent power regulation, allowing autonomous operation and inherent load following capabilities. The reactor is designed to run for more than ten years without refueling. It can provide combined heat and power from 200 kWe to 25 MWe, and process heat up to 600 degrees Celsius. Westinghouse said in October 2017 it plans to develop and demonstrate the eVinci reactor in less than six years. The company plans to develop a full-scale electrical demonstration unit to reduce technology gaps and demonstrate the ability to manufacture it by 2019, and has plans to qualify the eVinci micro reactor for commercial deployment by 2024. (NucNet): South Korea’s state-controlled utility Korea Electric Power Corporation (Kepco) has said it intends to talk to the British government about plans to build a new nuclear power station at the Moorside nuclear site in Cumbria, northwest England. Kepco had been a preferred bidder but lost that status in July as delays to concluding a deal dragged on primarily over differing views about costs. Last week Toshiba announced it had decided to wind up NuGen, the company overseeing the original plans to build three Westinghouse AP1000 units at the Moorside site. Toshiba said that it was taking this action because of its inability to find a buyer and the ongoing costs it was incurring. The company has already spent more than €459M on the project. From the outside what it looks like its that Toshiba, which is stretched for cash, wanted a premium price from Kepco for the project which that firm has so far refused to accept. The result is that Toshiba’s best alternative to a negotiated deal is to walk away. Toshiba put NuGen up for sale as part of its wider restructuring in the wake of financial problems triggered by losses in its US nuclear business which included the collapse of the V C Summer project in South Carolina. Kepco had said it wanted to use its own Generation III+ APR-1400 nuclear reactor design for the project, which has not yey been submitted for approval by Britain’s nuclear regulator. Once that happens it could take up to four years to complete the Generic Design Assessment (GDA) for the reactor. (NucNet): Nuclear regulators have completed their initial “high-level” scrutiny of the UK HPR1000 reactor design. They said, in typical government fashion, that the review has “not identified any fundamental safety, security or environmental issues that would prevent it being approved.” The review completes step two in the four-step GDA. Power Magazine reported last May that China is making significant headway on its Hualong One design. CGN in May installed the dome on the containment building of Unit 3 at the Fangchenggang nuclear power plant in western China, the first of two demonstration units being built at that site. China National Nuclear Corp., a separate nuclear company, is also building two Hualong One units at Fuqing plant in Fujian Province. The units are planned to enter commercial operation in 2019 and 2020. China General Nuclear (CGN) is a majority shareholder in Bradwell Power Generation Company, a joint venture with EDF, which is planning to build a one or more Hualong One plants at Bradwell B in Essex, southeast England. (Reuters) The French government has postponed a bill that has the timetable for the opening and closing of power plants, government. The delay to the bill, which was originally earlier this year, occurred because the government wanted to deal with another bill on financing railway and road projects. The energy bill is due to set a calendar for the opening and closing down of nuclear power plants over the next decade or longer. The previous administration committed to reducing France’s dependence on nuclear energy for electricity to 50 percent from 75 percent, which would require the closure of some reactors. France is conflicted over whether to replace its fleet of nuclear reactors as they age, or to seek other combinations of power sources. Green factions in the government have not supported the replacement scenario. In September French Environment Minister Nicolas Hulot resigned in frustration over what he said was “sluggish progress” on climate goals and nuclear energy policy. Another reason Hulot may have resigned is that the same week he quit the French government released a report calling for more nuclear reactors to be built to replace the country’s aging fleet. According to a WNA profile of the French nuclear fleet, all of the 900 MW units (34 reactors) will hit their 40 year mark in the next five years. Given EDF’s difficulties controlling schedule and costs at Flamanville, the report may have been the last straw for Hulot. On the other hand, if EDF was building a fleet of these units, there is no question the cost per unit would come down especially as experienced mangers and workers moved from one project to the next. (Reuters) Five groups are considering whether to partner with Brazil’s state-controlled Eletronuclear to resume construction of nuclear power plant Angra III, already partially built by the government. The interested groups are China’s National Nuclear Corporation and State Power Investment Corporation, South Korea’s Kepco Engineering and Construction, Russia’s State Atomic Energy Corporation, known as Rosatom, and a consortium comprised of France’s Electricité de France and Japan’s Mitsubishi Heavy Industries , the paper said. Current Brazilian President Michel Temer’s government is organizing the process, but contracts would probably be signed under the administration of President-elect Jair Bolsonaro, who will take office in January. Eletronuclear has said it wants to resume construction in 2020. An RFP is expected from the government in January. Brazil has a start and stop history of work on the Angra III reactor depending on whether the economy is flush or broke. In 2016 work was stopped when the head of construction for the plant was arrested on charges of corruption. (Reuters) Bulgaria may launch a tender to choose a strategic investor for its Belene nuclear power project by the end of the year if the parliament gives its approval to the plan, Energy Minister Temenuzhka Petkova said. Two Russian 1,000-MW VVER pressurized water reactor units were to be built at Belene before the project was cancelled in 2012 because of concerns over financing. Bulgaria faces a legacy of criticism of the project, first launched in 1981, that the investment does not justify the benefits and that the project has been a source of corrupt practices for decades. In the past Westinghouse refused to bid on the project for these reasons. European Union nations, and the U.S., have pressured Bulgaria to become less dependent on Russian technology hence the periodic revival of prospects for the Belene project. Reuters reports that Bulgaria lifted a six-year ban on a 2,000 megawatt (MW) plant at Belene in June and asked the energy minister to come up by the end of October with a procedure to choose a strategic investor for the project estimated to cost at least 10 billion euros ($11.3 billion). Bulgaria has paid more than 620 million euros to Russia’s state nuclear giant Rosatom for scrapping the project but also received nuclear equipment for the two 1,000 MW reactors and has to decide what to do with the stuff. It could sell it to another nation that has a deal for similar units. India is a good prospect due to it having broken ground for Units 3 &4 at Kudankulam and having started plans for Units 5 &6 also at that site. All of these reactors will be 1,000 MW VVERs. Paying for the new plants will be a problem. The government has said it does not want to commit more public funds, extend state or corporate guarantees for any loan, or offer preferential power purchase prices for Belene. External investor financing is hard to come by for new nuclear plants. Both Turkey and Romania have had problems raising money even with half of the financing coming from the nuclear vendors building the plants. The *whole idea* of an SMR is that they cost less because they are built complete in a factory. It is unclear what advantage they would have if broken down for transport. Oh geez. These communities don’t have clean drinking water. Fixing that would have far greater “disruptive socio-economic changes” than SMRs, where most of the value chain would be thousands of kilometers away.